If I recall correctly, it was Archimedes who said “Give me enough gaff tape and I will move the world“. So we are not going to move the world today, but we are going to control light with nothing more than gaffer’s tape. Hit the jump for more info. If you ever needed tight light control there is a good chance you resorted to using a grid. While we featured lots of small grids on the blog before, we never actually discussed the bigger grids that go on softboxes. Those big grids actually perform a similar task as the smaller ones. They keep the light restricted from places you don’t want it to go to. If you are using a smallish space, using grids is about your only option to use big lights and not have spillage and reflected light all over the place. Most companies that make softboxes and strip lights also make grids for them. So that is definitely an option. Sadly grids are expensive items. 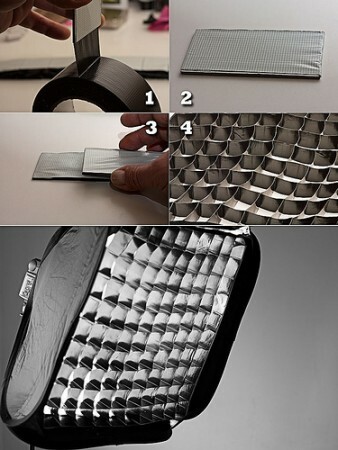 So If you have more time than money, flickr user ☣ cUKi has a step by step tutorial on making grids from gaff tape. “The concept is stupid simple. Using a cardboard template cut to the required size, make rings out of tape, sticky side out (1). Stick them on a smooth working surface, they will come out easily (2). Remove the template and press flat the cell with your finger. Stack the cells to the right half-length apart to make a row (3), in my case a row would be 10 cells long. Start the following row half-length to the left, carefully aligning the current cell’s right edge to the left edge of the second cell on the row below (no pic, sorry). Keep rolling and laying cells for as long as it takes. Don’t give up, don’t rush it, and DO NOT unfold the grid until it’s finished and no sticky surfaces are left uncovered. If you carefully align all the edges on all the rows, the structure unfolds as a pretty regular grid (4).